When the annual physical exam identifies a significant health problem, that’s definitely a plus. But what if it leads to a “false positive” test result that results in more tests and possibly even treatment that the patient didn’t need in the first place? Those concerns are at the heart of employers’ ongoing debate on whether to provide incentives for the annual physical and/or preventive screenings. On the one hand, you want to encourage employees and family members to have a relationship with a primary care doctor. On the other hand, you don’t want to expose employees to unnecessary tests and treatment. To help you sort through your options, The Alliance developed an “Insights on Annual Physicals and Preventive Screenings” guide. 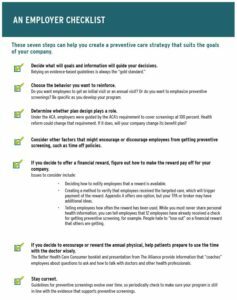 The guide includes seven steps that employers can use to create the right preventive strategy for their goals. Those seven steps are highlighted below to help you get started. The guide also includes advice from Consumer Reports; a Benefit/Risk Characterization Theater illustration from our 2017 Annual Seminar speakers; a sample incentive form; and the employer checklist that can help you get started on your strategy. I hope you find it useful as you develop the right approach for your organization and your employees for annual exams and preventive screening. Get the “Insights on Annual Physicals and Preventive Screenings” guide. View the video of 2017 Annual Seminar speakers Drs. Erik Rifkin and Andy Lazris. 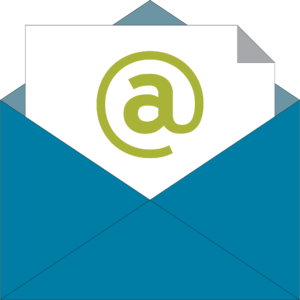 Schedule a “How to Be a Better Health Care Consumer” presentation for your workforce.